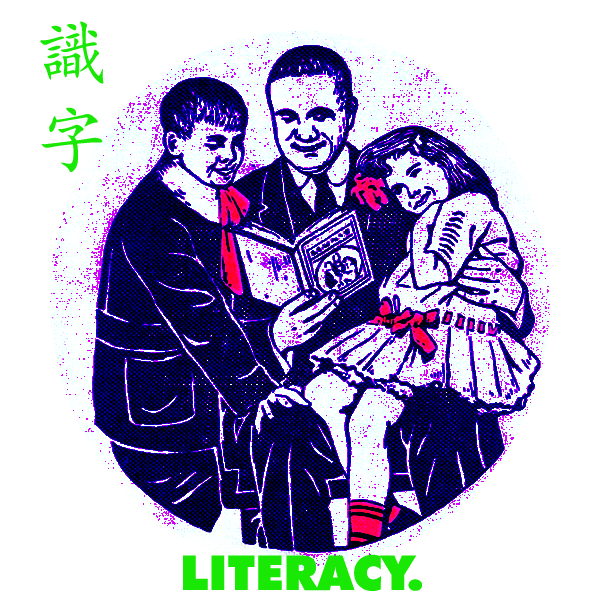 On Being Illiterate in Japan | 馬鹿外人 | This Japanese Life. Posted on December 8, 2010	by E.
There are incomprehensible signs, everywhere, and every sign is made of smaller signs I can’t read. I can’t read a map or follow directions. I am educated and illiterate, wealthy and incapable of communicating anything to anyone. But, I have an iPhone. I am crafty. I can order food in a restaurant by pointing at a cell phone picture of the plastic tray in the window. Show the waitress, eat. Like a lab rat, I have figured out the levers that lead to food. The need for directions, maps or understanding landmarks is irrelevant, because I have GPS. As long as my battery is alive and the signal is strong, I don’t need to learn anything. It is remarkably easy to find the meaning of signs: Electronic dictionaries (also built into my cell phone) show me the meanings of any Kanji character. Then I turn off the phone and go back to forgetting. In other words: I can afford a certain degree of faux fluency. Thanks to the financial dominance of English, there’s a sense in Japan that people ought to know how to talk to you. It’s never implied that you should learn the words for “left,” “right,” or “straight.” It’s embarrassing for them – it carries connotations of being uneducated, too lazy, or a rube. (I suspect Korean and Chinese immigrants have a different story to tell). English speakers are notoriously paralyzed by foreign languages. Even by being surrounded by one on a daily basis, my incentive to spend hours – nay, years – studying a foreign language wanes. At my workplace, speaking Japanese is actively discouraged: I’m a tool for learning English. I do my best work if I am kept in my pure, ignorant state. It’s simply too easy for exclusive-English speakers to stay that way. Nationally, America has a dismal track record for polyglots. Only 8 percent of US college students study a second language. When then-candidate Barack Obama suggested students should learn a second language as a requirement in high school, he was blasted for kowtowing to immigrants. The Brits do no better than the Yanks: 95 percent in Britannia are monolingual, a number suppressed in America merely by our higher rate of immigration: The US has more bilingualism because more people are forced to learn English. Australia is 80 percent monoglot. (New Zealand, like Canada, is fluent in French). None of this makes me feel better about whipping out my 80,000-Yen, 6,000-yen-a-month iPhone 4 to find out what room I need to pee in. I am not proud of my lack of ‘linguistic diversity’ and I’m not trying to excuse it. It’s an act of will. Occasionally this willpower inspires a burst of vocabulary acquisition and the casual perusal of language-school sites in Japan or online. Then one day I’d rather watch a movie, or go sight seeing, and it’s all so easy that I forget why I would ever stay home with flashcards. Now, my strongest incentive to speak Japanese is not what happens when I’m here, it’s what happens when I go home. Living in Japan without learning the language is like eating way more cake than everyone else. It’s bad for you, it’s selfish and it’s done purely out of a lack of willpower. It suggests a trail of annoyed waiters, grocery clerks and coworkers serving an oblivious white guy. I’m not cool with being accommodated without trying to give something back. It’s embarrassing. But here I am, writing a blog post about being illiterate as a stack of white flash cards stares at me through an intact plastic wrapper. This entry was posted in Culture Shock, Kanji, Uncategorized. Bookmark the permalink. This issue has come up at my job (teacher at a private English immersion pre-school). I’m not allowed to talk to my student’s parents in Japanese because, by my boss’s logic, I was hired to teach English and therefore if I were to speak Japanese, it would be wrong. I can’t even greet or thank them in Japanese, even if they don’t speak any English (which is the case of most of the parents). It’s frustrating because it reinforces the message of the gaijin who moves to Japan and is too stupid or lazy to learn Japanese and that the ability to learn Japanese is unique to Japanese natives. Imagine living in your home country, sending your kid to an Italian immersion school, and then being spoken to in ONLY Italian by the staff. It probably wouldn’t happen that way. You can do it, Eryk! You make me and my mostly-monolingual-self feel lazy. Confucius say journey of thousand mile begin single step! I wouldn’t compare not learning Japanese in Japan to “eating too much cake” so much as “eating a lot of cake and not gaining weight from it.” You know you can survive and get by, but you know it’s not the best option. I do feel guilty for not actively pursuing language study here and feel greatly humbled by the fact that my boyfriend came knowing almost nothing and just took N2 on the JLPT, which is the level required of native speakers. wikipedia does not agree with your ‘french as a second language in new zealand’ assertion…i’ve never been there, but from what i’ve read about it, the influence is first english, second native maori/polynesian, others (including europeans such as french) last. otherwise, interesting post! i always love the way you comment on the human side of things. Well if you click the link you’ll see I was making a “Flight of the Conchords” reference. I thought it was pretty obvious. Thanks though!